Here you are, your kids were playing football in the house and one of them got tackled into the wall. Fortunately they hit the wall in-between the studs and there are no physical injuries. You look at the wall and realize that the hole doesn’t match with the rest of your house decorations. 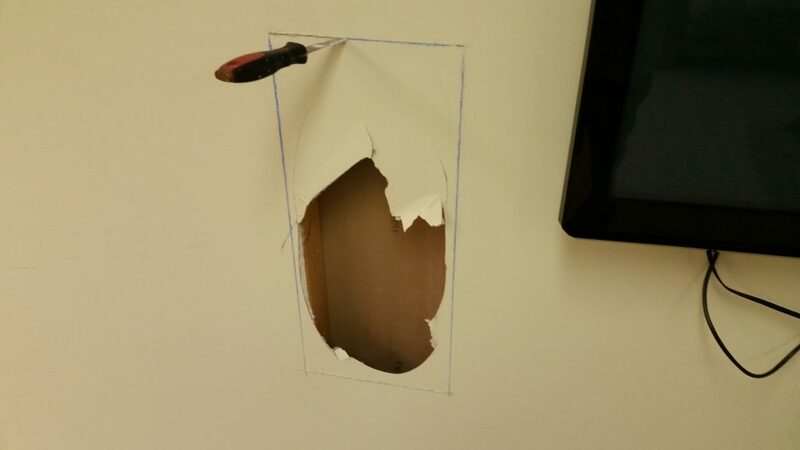 So you can decide to call a company like us that does drywall repair or you can attempt to fix it for yourself. Here is the Drywall Repair for Dummies guide. Although the taping portion is extremely difficult to explain, I can explain the rest and will do so … but first let me make a material and tools list. Plastic or drop cloth to keep the mess off of the floor. Tape measure, screw gun, keyhole saw, chalk box, razor knife. Screws (most of the time 1 1/4″ wood screws will work). Wood furring (something like a 2×4 or 2×2), saw. Drywall (measure the thickness of existing drywall and match that size, such as 1/2″ and 5/8″ for example). **Tape (either fiber mesh tape or regular paper tape). **Mud (I use quick-set mud for all of my patches, beginners may want to use regular mud. If you go with regular mud make sure you use All-Purpose for the tape coat and Light-Weight for the bed and finish coats). ** I will go into more detail about the best combination of tape and mud shortly. Before I begin with the drywall repair process I would like to talk about the tape/mud combination. Tapers may or may not agree, this is solely my opinion that is backed by 15 years of doing nothing but drywall repairs. For repairs, you are better off using the fiber mesh tape along with quick-set mud if longevity is the goal. It may be a bit tougher for beginners but if you can figure it out it will be well worth it. Fiber mesh tape and quick-set mud are made for each other with small repairs in mind. If using fiber mesh tape, you do not want to use pre-mixed mud as your first coat. Quick-set mud sets and dries very hard which is better for the fiber mesh tape, pre-mixed mud dries too soft for it. You will have to make up your own mind and decide which combination you think would be better for you. Sets fast to allow for multiple coats in a short time period (you can use a fan to further shorten the set time). Dries very hard compared to pre-mixed mud which adds to strength of repair. If used in conjunction with fiber mesh tape a repair can last a very long time. It comes in powder form so you have to add water and mix to correct consistency as needed. For some beginners it can take 10 mins. to mix up a pan correctly, bad news if your using 20 min. If not mixed up thoroughly enough you will have lumps in your mud, thus making your taping job tougher. It can be harder to work with compared to pre-mixed mud for beginners. Check out our “How to install Drywall” eBook. It covers material calculation, drywall installation and drywall finishing. Now that you have all of your tools and material you’re ready to get started. First take your tape measure and measure however is most convenient for you to make a nice square around the patch. Next take your chalk box and snap lines in-between your marks, you should end up with a well defined square. With your keyhole saw in hand cut out your chalk lines so that when your done you have as close to a perfect square as you can. Make sure that you actually cut or score the drywall around the entire perimeter prior to removing the drywall. The reason behind this is to make sure that the outer layer of drywall paper does not tear into the rest of the wall. At this point your ready to add some wood furring to be used as backing for the new drywall. Rule of thumb is that you should have a solid wood surface to screw your drywall to every 6″. Cut your wood furring accordingly to accommodate this. Your patch does not have to be cut on the wooden or metal studs, if it’s not just add plenty of wood backing. Now your hole is prepped and ready for the next step. A quick rundown on what we just did. By cutting the hole out square we have now made it easier to get a piece of drywall to fit. The tighter the drywall fits in the hole the better. We added wood backing for support of the new piece of drywall. When it comes to our seams lasting a long time we need to reduce movement, more backing does just that. Like us on FaceBook to keep up with our in-depth posts on all things drywall! Take your tape measure again and measure the hole from top to bottom on the left, and top to bottom on the right, write that number(s) down. Now measure from left to right on the top, and left to right on the bottom, write that number(s) down. If you cut your hole out nice and square you should have two numbers, example being 24″ height and 14″ width. If your hole is a little off then you may have four different numbers, example being 24″ height (left) 24 1/4″ height (right) and 14″ width (top) 14 3/8″ width (bottom). Move over to your piece of sheetrock and measure your numbers on the drywall, then use your chalk-box to snap lines. Use a combination of your keyhole saw and razor knife to cut the drywall and take your piece over to the hole. Once you set the piece in the hole you may have to do a little trimming to get it to fit. Take your screws and set them around 6″ apart all the way around the perimeter and on any center studs if applicable. If you have any gaps in-between your new drywall and existing drywall you need to back fill them with mud before you start taping. Once your repair is back filled and the mud is dry take your fiber mesh tape and apply it to your seams. Add your first coat of mud with a 10″ or 12″ metal knife. If you go the paper tape method, spread your mud on the seams about 6″ wide. Cut the tape to fit with no gaps and place it on the seams. Then wipe the tape down, if you press too hard you will squeeze all of the mud out and you will get a “bubble” effect, if you don’t press hard enough you will have a mound which will prove hard to float out. Find the happy medium, if you get the “bubble” effect no big deal, just add more mud under the tape and wipe down again. That covers your first coat also known as the tape coat. For the second coat you take your 10″ or 12″ knife and get some mud on it. Set one end of the knife on the center of the tape and apply the mud evenly. Now put some more mud on your knife and do the other side of the seam. In other words, if you use a 10″ knife you should have ~20″ wide strip of mud on one seam. Do this around the perimeter of the repair. After the mud has been applied take your knife and wipe down one side first, then the other side, then the middle. You may have to play with it a little bit to get the desired effect. Also remember that sometimes playing with it will make it worse, it’s okay to walk away and fix it on the next coat. Finally, the third coat. Take your knife and instead of running two swipes of mud, make it three. For example, if your using a 10″ knife you should now have a ~30″ swipe of mud centered on your seams around the whole repair (doesn’t have to be exact). Again, wipe down one side, then the other side, then the middle again. Your repair should look pretty good by now. By good I mean flat and smooth. **Note: not every repair requires the seams to be floated out that far. You will have to run your hand over the surface to determine this. If your repair has waves or scratch marks or anything of the sort just add another coat of mud. Be sure not to pile too much mud on at anytime. Once the repair is looking pretty good, take your sanding sponge and do some sanding. After sanding is done do any touch-ups as necessary. Beginners may need to sand in-between each coat. Visit our website if you get bored. We specialize in drywall repair and are based out of St.Louis, MO. I hope that wasn’t too scary. The first drywall repair is always the hardest, and it normally gets better from there. Doing your own drywall repairs can save you money and in tough times it may be the only option. If it is not the only option and you want perfection, then call a professional. Taping along with a few other things in the drywall repair field can take years and years to master. It is one of those things that you can not truly learn by reading an article or a book. Leave a comment or share this article if it helped you. Nations Drywall Repair is a small company owned and operated by Richard Nation. He started this company back in 2007 when the economy was rough and God willing it is now a full blown business. We have 2 workers, Richard, the owner and Joe. Joe is a hard working American who takes pride in his work and has an exceptional work ethic. You will definitely be satisfied working with us. Copyright © 2019. Designed and Powered by Ignite Web Conceptions.